Important Messages Alert — . :: GSA SEO & Marketing Forum ::. I had "important messages" for 3 of my projects that said I needed new articles. I added 100 new articles to each project and within 48 hours it's telling me to add more articles again. Each project has only made 20-30 links each since adding the new content. Also, I tried to use the "Suggestion/Feedback" link in the Help Menu but it now takes us to a 404 page. 404 error was fixed...please use the contact form on the main page. 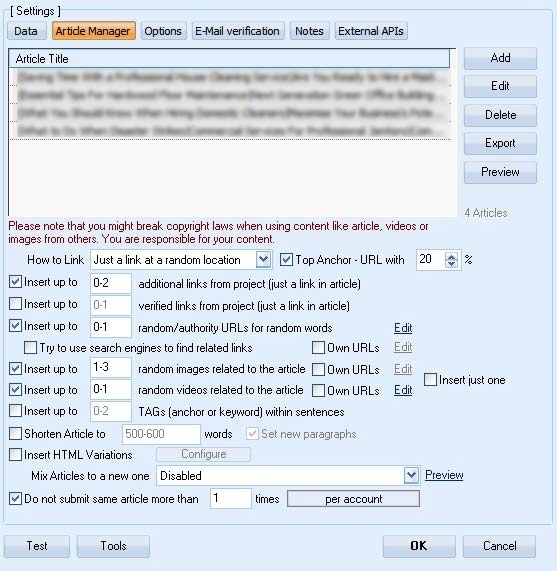 what options do you use for article manager -> duplicate checking (at bottom)? What do you use for scheduled posting setting? If you have that enabled and use more posts per account than one, it could give you that error as well. As you use spin syntax, I suggest you to increase the "1 times" to like "10" at least (depending on your spin syntax complexity).